Rainmaking Recommendation #132: Want More Referrals? Do They Know What You Do? You are here: Home / Coaching / Rainmaking Recommendation #132: Want More Referrals? Do They Know What You Do? When asked by someone – whether at a party, a networking event, at a family reunion – “what do you do?”, too many attorneys answer: “I’m a lawyer.” Or maybe you switch it up and say: “I’m a __________ (fill in practice area) attorney. You and 1.3 million other people who practice law in the United States. And, every person to whom you say this has their own idea about what a lawyer is like and many of their impressions are not necessarily flattering – the media has not always portrayed our profession in the best light (sometimes well deserved, mostly not); and, until they need one, most people do not have a great feeling about who lawyers are, and what they do. They unfairly lump all attorneys together. Many people who need a lawyer will ask a trusted friend or advisor for a recommendation. You want your name to be the first one that is mentioned when that happens. 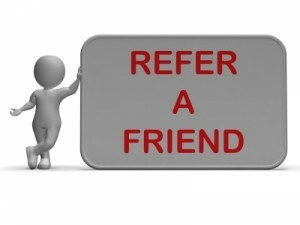 If you want referrals, you need to let others know what you do. And not just that you are a lawyer. While you may get a referral because someone knows you are an attorney, it doesn’t mean it is in an area that you practice. You will either have to say, “I don’t do that kind of work,” or refer it to another attorney who does practice that area of law. Instead, you want the perfect referrals for you: referrals in the areas of law you practice, and to your ideal clients. To do this, you need to tell people what you do in a way that will make them truly understand what you do as a lawyer, who you help, and how you can ease the other person’s pain; and to do so in a memorable way. This is known as your “elevator pitch” or your “audio business card”. I am a Rainmaking Trainer and Coach. I teach attorneys (ideal clients) to develop big books of business (their problem) ethically (solution). When I tell people what I do, I know that they will know at least one lawyer who can use my help. If you can leave an unforgettable impression of who you are, who you work with, and what you do with your audio business card, you will get referrals when someone asks if they know a lawyer who can solve that problem. LEARN TO BECOME A RAINMAKER AND GET YOUR ETHICS CREDITS! NOW PROVIDING CLE’S IN NY, NJ AND PA. IF YOU ARE IN A NEW YORK OR NEW JERSEY LAW FIRM AND HAVE 10 OR MORE ATTORNEYS, SCHEDULE AN ON-SITE RAINMAKING TRAINING SEMINAR IN 10 DIFFERENT TOPICS – EACH WITH ETHICS CLEs. CONTACT ME FOR DETAILS (More states being added each month). Want to bring group Rainmaking coaching to your firm? Try Individual Rainmaking Coaching? No matter where you are in the United States, coaching can be done in person, via Skype or telephone. Call or email for more information.